Andante Silverblood "Every time you try to forget who I am I'll be right there to remind you again"
His frame is well sculpted, muscular yet lithe to a degree. His pelt is coated in dark obsidian, absent of any other color until one looks upon his legs. There he sports four ivory socks standing out in stark contrast with the rest of his black fur. Resting upon the length of his spine and following the extent of his ribcage are chrome colored bony protrusions. Which give him a slight skeletal appearance. His head is crowned with a series of chrome colored horns spiraling outward while an intimidating curved horn rests on his forehead. Sitting along the curves of his jaws are two more sets of dagger like protrusions to top it all off. Hidden away within the realm of his jaws are countless fangs, sharp and serrated. His tail takes the shape of a lions with a long and flowing crimson tail tip decorated with a number of silver spikes. 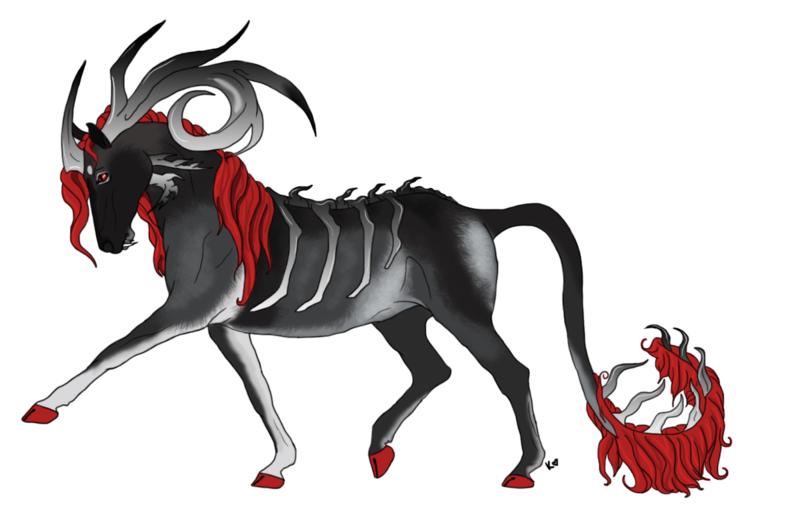 Like his tail, his eyes mane and cloven hooves all share the same deep red coloration as well. Andante by nature is the dark and brooding sort. He finds resentment towards those brought up with an easy life, or those too weak to find strength within themselves. A firm believer of the old saying "kill or be killed", he does not waste time with trivial matters and would not hesitate exchanging blows. He is a proud horse, taking great pride in the lineage flowing within his veins. Andante carries himself in a regal manner and is careful to keep others at a distance. He believes that emotional weakness is just as bad as physical and therefore keeps a professional and even pompous air around him. Although he truly fears that if someone were to get too close it would cause his downfall. Likewise anyone lucky enough to get that close would be able to see that he hold good qualities as well. Fierce loyalty, charm and compassion being amont the select few. Born of a former reigning king and queen, Andante is a forgotten prince in his original homelands in the wilds of Elysium. After his mother and father lost their crowns to a challenger named Ker, his mother Nightingale stole him away to seek a place of refuge for the young colt. While his father Abrin and twin brother Nox choose to remain behind, keeping to the herd of the heretics. Tensions rose within Elysium and while Nightingale did secure him a save haven in another herd, she vanished. Andante remained anxious for his mother's return, yet obediently remained in the dark woods of Crucis. Each day he would venture just a little further and further in search until he left his fostering herd completely. Jealousy prohibited him from returning to the Heretics where his father and brother resided. Loathing the fact that his twin was the favored colt out of the both of them. Choosing the life of a rouge vagabond the colt spent countless days and nights seeking the mare, travelling the world of Elysium. Eventually, he stumbled upon a young filly named Iracebeth and after learning of her own mother's disappearance grew very close to her and Iracebeth became his very first friend. Time passed and soon after he was reunited with his mother again though the reunion was bittersweet. They spent some time together catching up but he realized she was not the same and remained distant from him. It seemed as if Nightingale had vanished completely all over again, once again leaving him alone and motherless. Becoming restless and confused he accepted Iracebeth's invitation to leave behind Elysium with a greater goal in mind. Hoping that the journey would give him some insight as to his purpose in life, he now travels with Iracebeth and Ezera into lands unknown to him. Power Negation: The ability to cancel out the magical powers of other beings as they are being used. It can also be used to reverse or undo spells as well as nullifying the power of some magical objects. Apprentice: Can create a very small field around himself that dampens the effects of magic being used directly against him. The field can only be kept up for a short period of time. Adept: The size of his force field has grown a couple of inches and Andante can nullify the effects of magic for a longer duration of time through matters of direct touch. Master: He can now shoot blasts of negation at others that stand at far distances to cancel out their magic with great accuracy. The vastness of his force field has reached new levels and can stretch further a few feet upon his command with minimal effort. Virtuoso: Powerless and ordinary are those that find themselves standing within the invisible force field that carries on for yards at the bend of his will. At this level he can even prohibit the field from effecting certain individuals in the field while hindering others. Appearance: A towering, brutish hound standing taller than most equine. Standing proudly at nearly 25 hands high at the withers he truly is a sight to behold. Dark stygian black fur coats his body leaving no other color to decorate his heavily muscled frame. His ribcage is translucent leaving the roaring fires within him behind dense ebon bone to be seen to those that lay their eyes upon him. All along his topline and hackles crimson flames flicker and sway in cold fire. Protruding bone decorates much of the hound's spine and tail much like Andante himself. Columns of smoke constantly waft from his nostrils and wisps of shadow drift from his bodice giving Naveed an even more ethereal appearance. Sitting atop a his large visage are sharply pointed eldritch ears and buried deep within said skull are two glowing scarlet eyes both wise and ruthless.